To disclose or not to disclose ………….? People get all hot and bothered about this subject and start quoting laws and rights and bills and all sorts. You are not obliged by law to disclose your diagnosis and they’re not allowed to ask you about your health. This is to protect against discrimination and its very important. Lots of MSers say they’ve kept their diagnosis secret during interviews for fear of being judged and defined by their condition, presumably hoping a relapse won’t rear its ugly head at the wrong moment! This is understandable and I’ve certainly done it myself in the past but what about the rest of us who’s MS is blindingly obvious as they hobble into the interview room? I don’t have the luxury of hiding my condition but this doesn’t have to mean its game over! I’ve been short-listed for a job this week and they sent me details of the interview by email. The usual fear and anxiety kicked in as I imagined not being able to park anywhere near or having to walk round endless corridors to the interview room, exhausting myself before I’d even opened my mouth or worse, not being able to hobble to the loo in time! Bloody hell!! Could this mean they actually meant it when they said they don’t discriminate? I called the HR lady and she couldn’t have been more helpful. We discussed the venue and how much walking was involved (I want to avoid using my scooter if possible) and she arranged for me to park near the lift so it was only a few steps followed by a short walk at the top. She also suggested I come and have a look at the venue to put my mind at rest and discussed more accessible office bases should I get the job. Nothing was too much trouble. I mentioned in a previous post that I used to work for them before. They had been so good when I eventually disclosed my diagnosis (I was spotted dragging my right leg behind me trying to cover up a relapse!) Coincidently the interview panel consists of my old boss, who’d been brilliant and knows all about my diagnosis, and another ex-colleague I knew very well. I’m hoping this will be an advantage, or will at least make me feel comfortable enough to do myself justice. We will see what happens on the day but by disclosing my disabilities I have been offered the help I need to compete on a level playing field with everyone else. 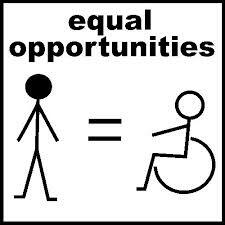 This is the essence of equal opportunities and its refreshing to experience it in action!